America is about to view a remake of a classic story. It's not a multi-million-dollar Hollywood comic book-turned-movie spectacle nor a modernized version of a long-favored stage drama. Rather, America is discovering a 700-year-old stage for herself - the story of the Janissaries. The Janissaries were the elite fighting force of the Moslem Ottoman Empire for centuries. 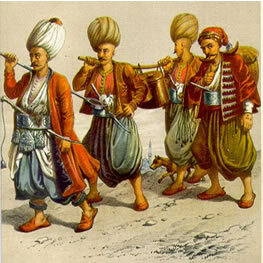 Their ranks were filled with young Christian men (who often converted to Islam) conscripted to fight for the sultan. They became instrumental in holding together the Ottoman Empire precisely because they were free from the tribal loyalties that left other Moslem Arabs and Turks, at times, conflicted. In today's parlance, we would merely call them Moslem extremists. While most reporters (and unfortunately the White House) look at the John Walker Lindh and Jose Padilla stories as some type of strange socio-religious anomaly, these instances are anything but. The advent of Jihad Johnny and Abdullah al Muhajir represent the revival of a proved weapon of radical Islam - the Janissary warrior. And the recruitment has just begun. The key element in the recruitment of the new Janissaries is to seek out and evangelize those who are disaffected with Western culture. In the case of John Walker Lindh, Islam provided a young man with moral boundaries when his parents would (or could) not. With Jose Padilla, the story was different. Padilla was recruited to his new vocation as an Islamic terrorist after prison. Time will show that Padilla was not alone. Perhaps the foremost expert in prison evangelization in America is Chuck Colson, co-founder of Prison Fellowship Ministries. Colson is now warning that the Islam being preached is neither "noble" nor "peaceful." In the June 24 issue of the Wall Street Journal, Colson relates the story of how, when addressing an open meeting of prisoners, his use of the name Jesus was met with attempted censorship by Moslem inmates who upon hearing the name would turn up the volume on their portable radios. Not stopping there, Colson states that the multi-faith gathering came within a hare's breath of becoming a full-scale prison riot - his ability to quiet the Christian prisoners being the pivotal factor. Colson also made mention that Al Qaeda training manuals outline plans whereby American inmates are targeted for conversion because such individuals may be "disenchanted with their country's policies." These "converts" are extremely useful to terrorist groups as the inmates "combine a desire for 'payback' with an ability to blend easily into American culture." This Islamic prison outreach, as recommended by Al Qaeda, is taking place - the most prominent ministry being the National Islamic Prison Foundation. Colson also notes that a main funder of such programs is none other than Saudi Arabia. While the new American Janissaries, harvested from penitentiaries, could prove eminently useful to terrorist groups in waging a domestic terror campaign upon America, the solicitation of Moslem acolytes is not limited to American jails - nor even to America. Islamic "missionaries" have also descended upon the volatile Chiapas region of Mexico. Since 1996, more than 300 conversions amongst the Mayan people have been made. According to the Houston Chronicle, the leader of the Islamic group, Shaykh Abdalqadir as-Sufi, "has sharply condemned democracy and global capitalism." The Chronicle also provided a telling quote from Moslem missionary Esteban Lopez: "There isn't a pure Islamic government in the world. That's what we hope to create." All of these patterns lead us to serious questions that need to be asked. Many Moslems have traditionally been critical (if not paranoid) of the proselytizing nature of Christianity. Such skepticism about the honorable intentions of Christianity led to the imprisonment of Dayna Curry and Heather Mercer in Afghanistan for their overt religious discussions with Afghani locals. It is also the attitude that makes it illegal to wear the religious garb of a faith other than Islam in Saudi Arabia. But now Moslem missionaries seem to be turning up in the oddest places, places that are violent and unstable, places where the people might harbor animosity toward American society, places recommended in Al Qaeda's grand strategy. Saudi money also seems to be in play. Are we prepared to ask the hard questions? Probably not. And so the conscription of the new Janissaries continues. Under the guise (and legal protection) of a noble religion, the forces of radical Islam recruit disciples, for whom there is only one prerequisite - a hatred of America. All this is an old tale . . . but now it's coming to a theater near you. C.T. Rossi comments on contemporary culture for the Free Congress Foundation.